There were two school of thoughts going into today's game. Atlanta's lead on Metro was four points with four games left; anything but a victory would make the Shield an improbability. So maybe... it was best not to win, to take it easy the rest of the way. The first round bye has been clinched, so why run your players into the ground in pursuit of the lesser of MLS's two titles? So Metro won, demolishing the supposedly-superior contender, laughing to a 2:0 victory that was a clinic for almost the entire match. So that! 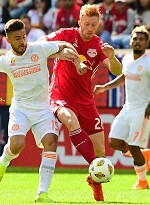 Bradley Wright-Phillips' absence due to a ridiculous red card was known, but Tyler Adams missing the game due to back spasms was a piece of late news. In their place came Brian White, in just his second league start, and Alex Muyl, which meant that Marc Rzatkowski moved into Adams' spot. There has been lots of discussion about Chris Armas' modification of Jesse Marsch's approach, but today, the press was out in full force. Metro grabbed Atlanta by the throat and didn't let go for the entire first half. Midway through the period, a quick free kick saw Muyl get behind the defense, with Brad Guzan taking him down in the box. A penalty was initially signaled, but was wiped out by VAR when it was determined that Guzan got all ball. A few seconds later, off a set piece, Tim Parker finished for what looked to be his first Metro goal, but it was called back for offside. The breakthrough came in the 39th. This time, a clear hand ball in the box gave no choice to the refs for taking it back. Daniel Royer stepped up to the spot and beat Guzan, remaining perfect on PKs during his Metro career. Metro let off the press early in the second, but the defense took over. The back-breaker came in the 74th, after Rzatkowski sprung Muyl in the box. The previously-maligned midfielder would not be denied by Guzan this time, sending a fantastic touch around the keeper and into the net... where Parker did touch it to finally get that first goal. Metro could have made it a bigger scoreline after a late handball in the box, but Alejandro Romero Gamarra's penalty was saves. The game ended 2:0, with Luis Robles recording his 12th shutout of the regular season, a team record. With three games left, Metro now sits at an amazing 62 points, its best total ever. Shield or no Shield, this team is special. How is that for a school of thought? Lineup: Robles, Lawrence, Long, Parker, Murillo, Rzatkowski, Davis, Muyl, Royer, Romero Gamarra, White. Subs: Etienne, Ivan.